Video famously ‘Killed the Radio Star’ in 1979 and now, with its use becoming ever more popular as a conference communication tool, the medium looks determined to replace PowerPoint as king of the board room. Since its conception in 1990, Microsoft’s ubiquitous presentation software has been the saving grace of many presenters, seeking to support their words with graphical data and content slides. Nonetheless, twenty four years on and several makeovers later, are we gradually witnessing the ‘death of PowerPoint’…? 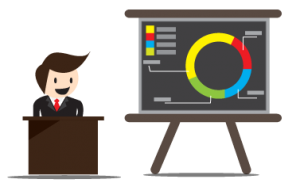 There’s no doubting that traditional slides and fancy transitions can add an extra dimension to an otherwise dreary presentation, and, where arduous stats, laborious reports and complex processes need to be liberated, PowerPoint has reigned supreme for many years. Its relative simplicity and wizard-generated templates, offer even the most technologically laggard among us, the ability to flex our creative muscle. However, with an innate ability to convey emotion through sound and images, break down virtual walls through animation, Digital Video has undoubtedly become new kid on the block. Naturally, as with any form of professional communication, delivering bespoke video or animation content comes at a price. The beauty of PowerPoint remains it’s ability to create bespoke presentations with comparative ease; conversely, creating slick video presentations, (of a quality you’d be proud to stand by) for the most part, should be left to the professionals. The good news is the cost of commissioning professionally produced video has reduced in the last few years. Thanks to advanced digital technology and online functionality, both the speed of video production and the flexibility of the medium as a communication tool have increased dramatically. Whether presenting promotional video (customer facing) or corporate video (internal audience), emotive video content arousing loyalty, trust and motivation, will always trump traditional slide based data. In terms of what type of content is effective in this arena, customer and supplier testimonial videos are very common; delivering genuine feedback, ‘straight from the horse’s mouth’ is hugely powerful. The ubiquity of the ‘info-graphic’ (animated text and graphics) is another potent tool in Digital Videos armory, bringing to life a range of text based messages, creating impact and improving recall. In many cases video is being used to replace the speaker themselves. The benefits of video being edited, polished, supported by audio, graphics and animation, will always drive a desire to simply click ‘play’ and sit down; after all, video doesn’t suffer nerves, delivers pitch perfect every time and doesn’t care whether the audience consists of five or five thousand people! As for the life span of the traditional slide-show? We’d always suggest that content, whether Digital Video or PowerPoint, should support your presentation; there’s little point in playing a video of yourself talking to the camera for ten minutes if you can deliver this in person. Audience reaction will be equally negative in the event of an entire presentation being delivered within a poorly structured slide-show. In summary, audiences will always seek to be inspired, motivated and informed. In the pursuit of the perfect presentation, a polished delivery (in person) should be always supported, where possible, by content which drives emotion, connects and visually stimulates. Get it right and you’ll succeed in engaging even the frostiest of audiences. Embedding video in PowerPoint? …well that’s another story.